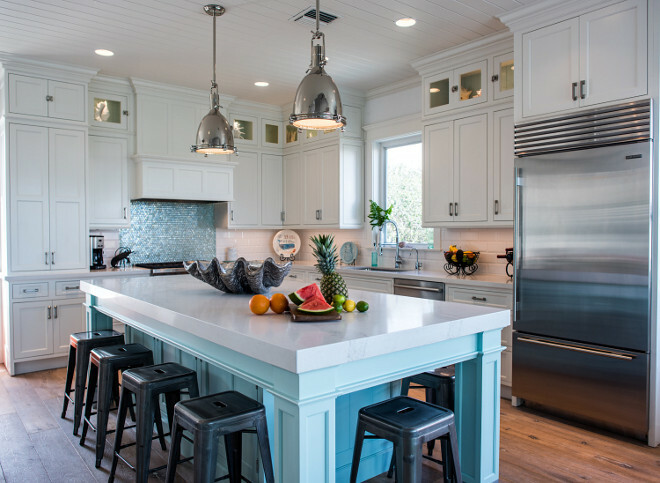 Designed by one of the best kitchen and bathroom designers in Florida, Waterview Kitchens, this coastal white kitchen with turquoise island is here today not only to inspire but also to take our mind away from winter and bring us to the beach! This home is located in Key West Village in Tequesta, Florida on the Intracoastal Waterway. The 24 homes in this neighborhood are all Key West Style. Each home is painted in a pretty pastel color complete with a metal roof, white trim mouldings and a front porch. 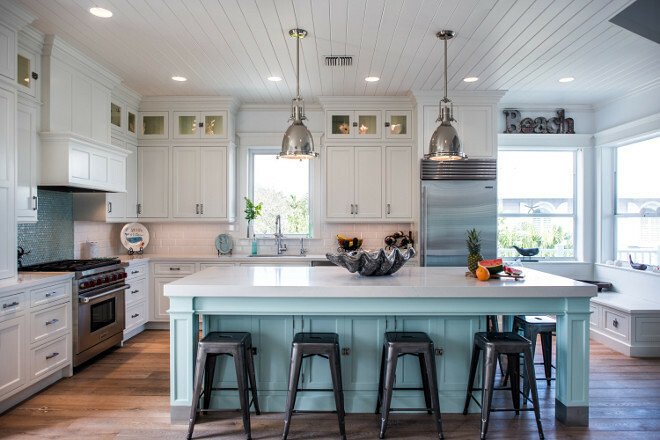 According to the designer, Patty Anderson from Waterview Kitchens, the family wanted an open concept design incorporating an island as large as possible for the entire family to gather around and have enough space to mingle and eat together. The “table end” really worked to achieve this. 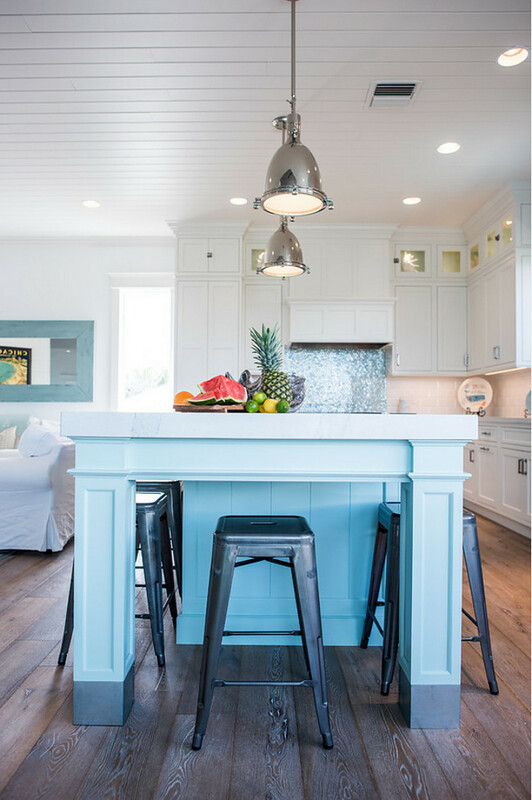 Several moulding profiles, v groove island ends, zinc cladding on the legs and the custom color all really set the island apart. 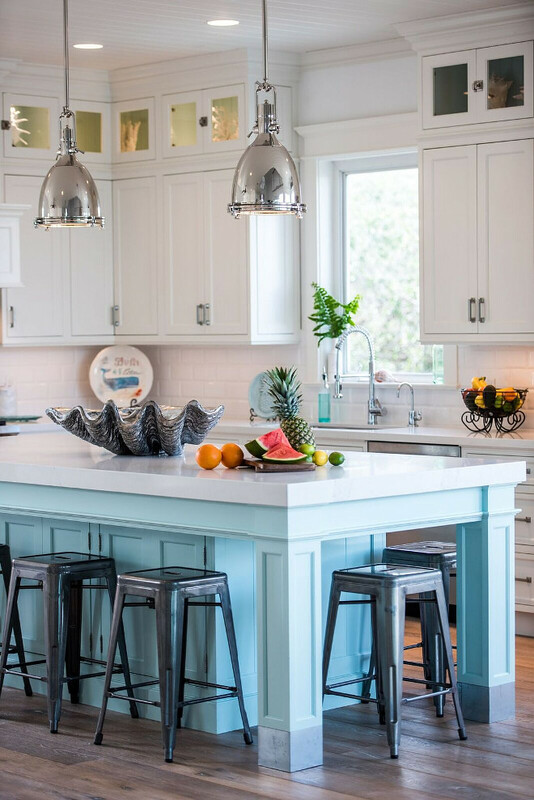 The beachy theme of this home dictated the design of the kitchen. 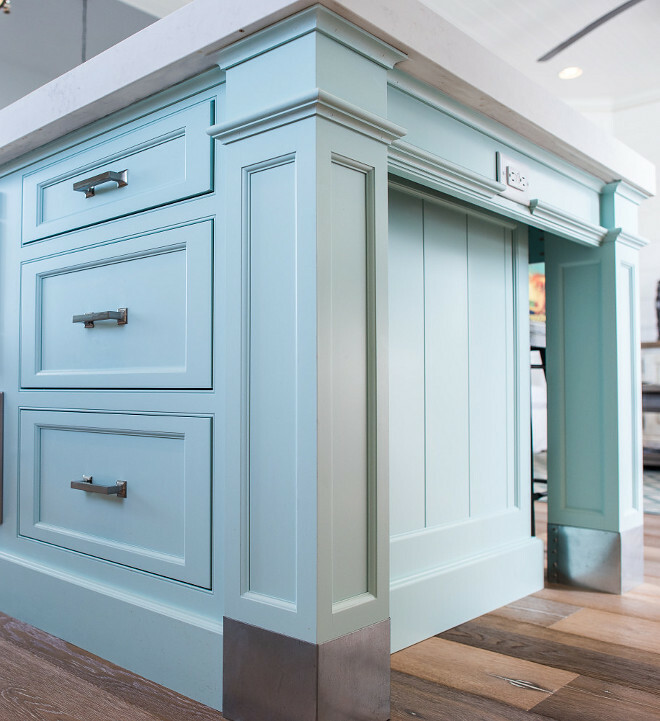 Incorporating the aqua colors of the intracoastal waterway outside was an important aspect of the project. Make sure to save, pin or bookmark this post. The designer is sharing all of the details with us today! 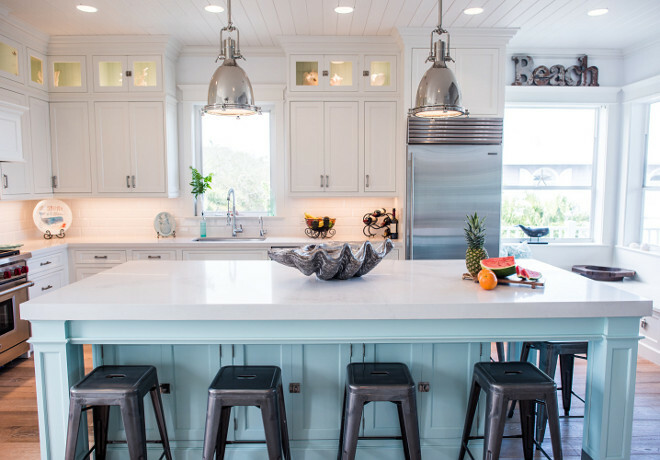 This kitchen is a good example of how to design a coastal space while maintaining a timeless appeal. 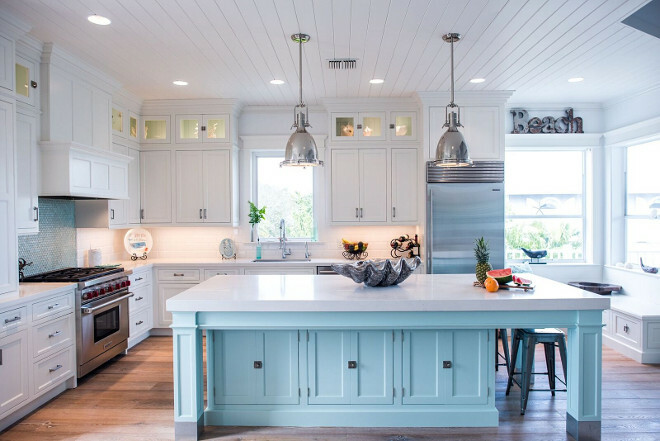 The classic white cabinets and the soothing aqua color used on the island will never go out of style. The fridge is a Sub Zero 36″ with a bottom freezer drawer. 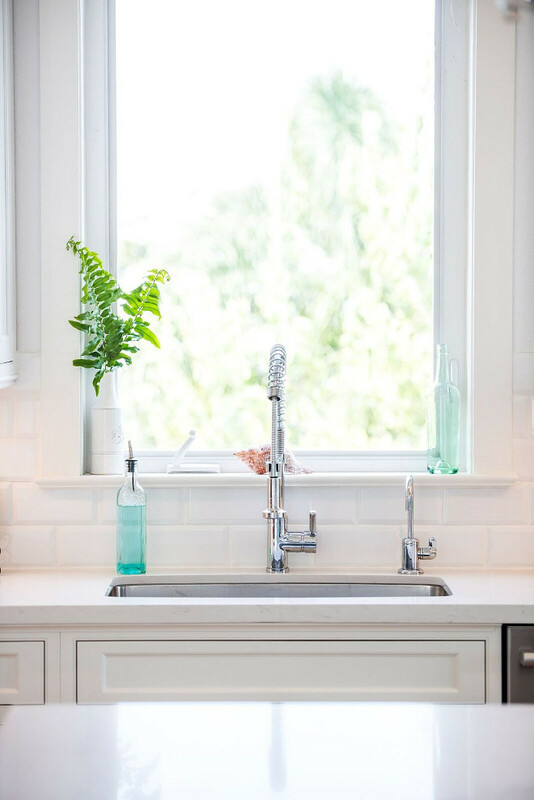 Kitchen Backsplash: The white beveled subway tiles are Porcelanosa Retro Bainco 4 x 8 White. Aqua glass penny tiles by Tesoro; Tesoro Listello Reflections Tourmaline Mosaic Penny Round Tile. The designer calls them “Mermaid’s Tail!” Don’t you just love that? I can’t tell you enough how much I love this kitchen. For me, it truly feels happy and crisp, not to mention functional! Notice how every element complements the next. You certainly can feel the serenity of this space. 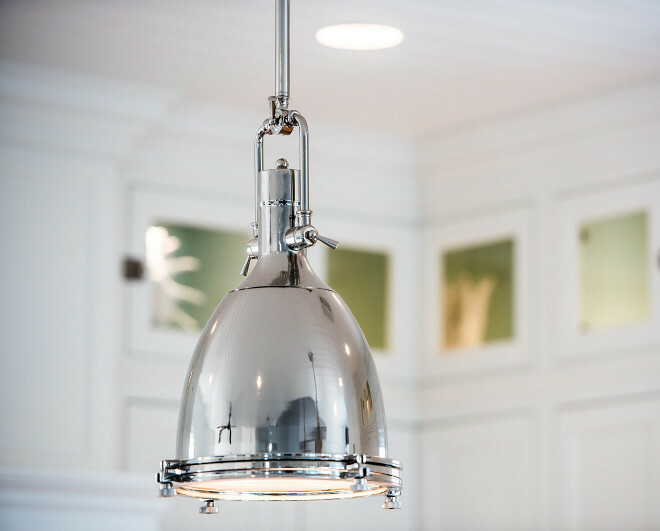 The kitchen island pendant is Hi-Bay 25104 Pendant by Maxim Lighting in Polished Nickel. The lights are 6″ and they are spaced about 48″ apart. 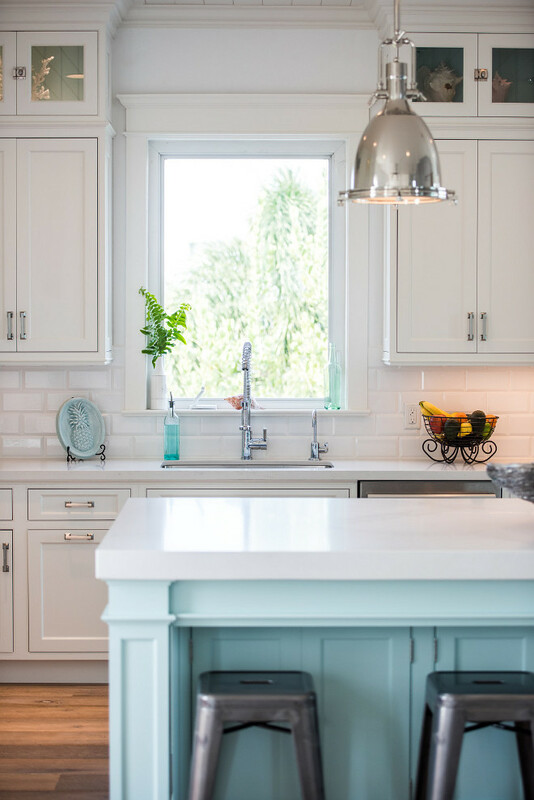 Perimeter Countertop: Caesarstone Frosty Carrina. 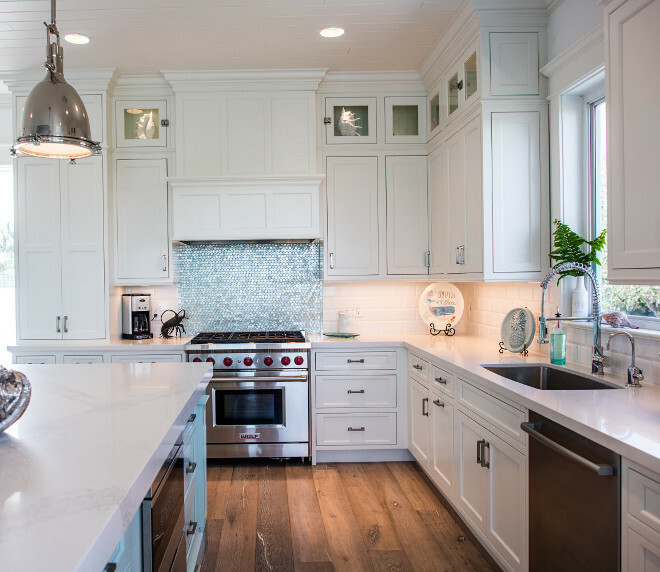 Island Countertop: Caesarstone Calacatta Nuvo 3″ miter. 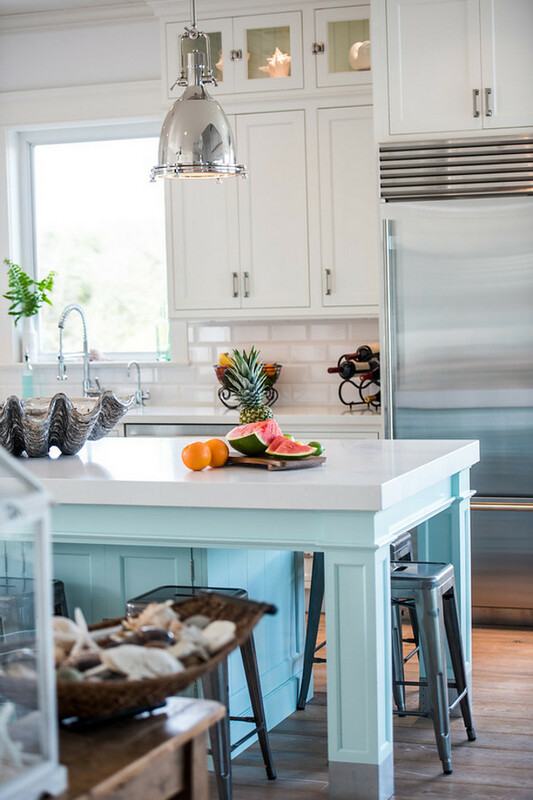 White Cabinet Paint Color: The cabinet paint color is Crystal’s Frosty White, which is similar to “White Dove OC-17 by Benjamin Moore”. The kitchen faucet is by Miseno – Miseno MK281-PC Polished Chrome Mila Commercial Style Pre-Rinse Kitchen Faucet. Love it! 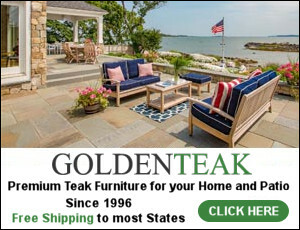 Cabinet Hardware: Hickory Hardware Studio Collection P3011-SN Satin Nickel. 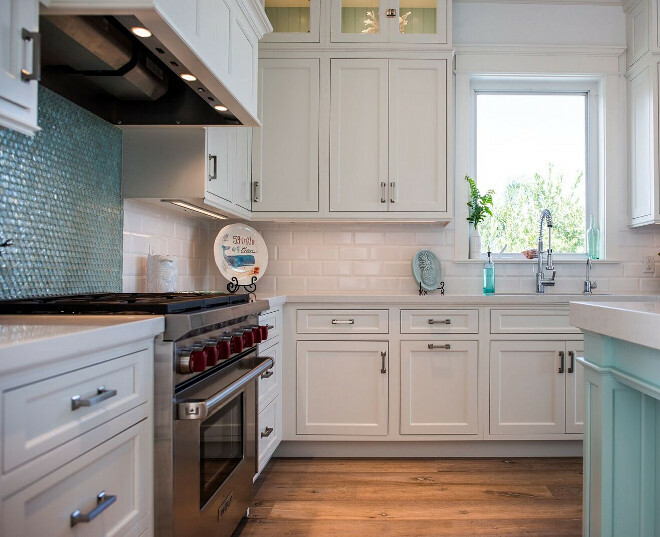 Latches on Glass Upper Cabinets & Island Cabinetry: Top Knobs TKM1779 in Brushed Satin Nickel. 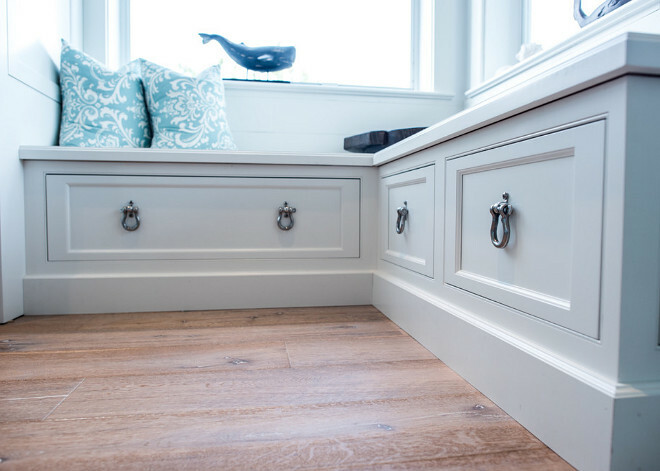 Flooring is Oil rubbed White Oak – St. Moritz from DuChateau Floors. 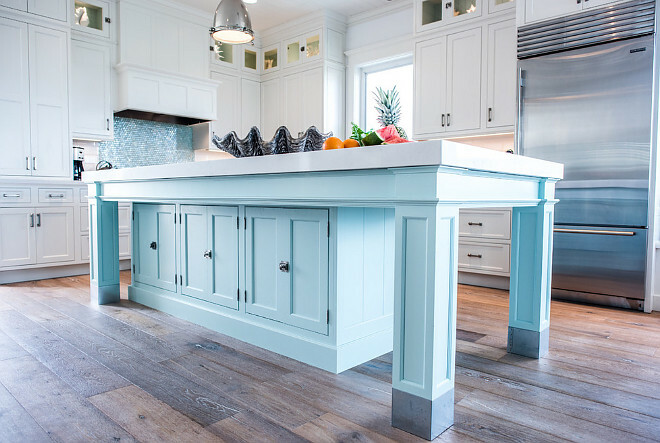 Kitchen Island: The aqua kitchen island features a custom aqua color developed by Waterview Kitchens and Crystal Cabinets. “Sherwin Williams SW 6463 Breaktime” is a close color. The kitchen island features v-groove on each end of the island and zinc cladding on the legs. 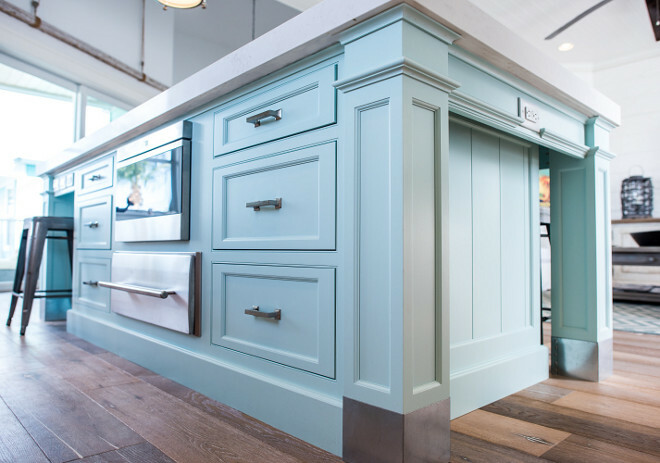 The cabinetry is 36″ x 80″. 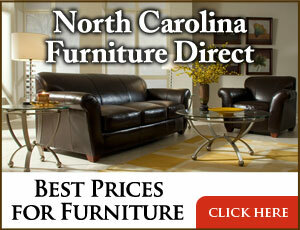 The overall dimension is 50″ x 114″. Wall paint color is “Benjamin Moore PM-1 Super White”. Trim and ceiling pain color is “Benjamin Moore White Dove”. This corner window-seat is a great place to relax and enjoy a fresh cup of coffee. Drawers keep everything organized and within reach. Window Seat Hardware: Stainless Boat shackles from West Marine. 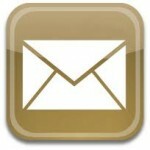 All flooring and tile work was done by Treasure Coast Carpet and Interiors, in Tequesta, FL. 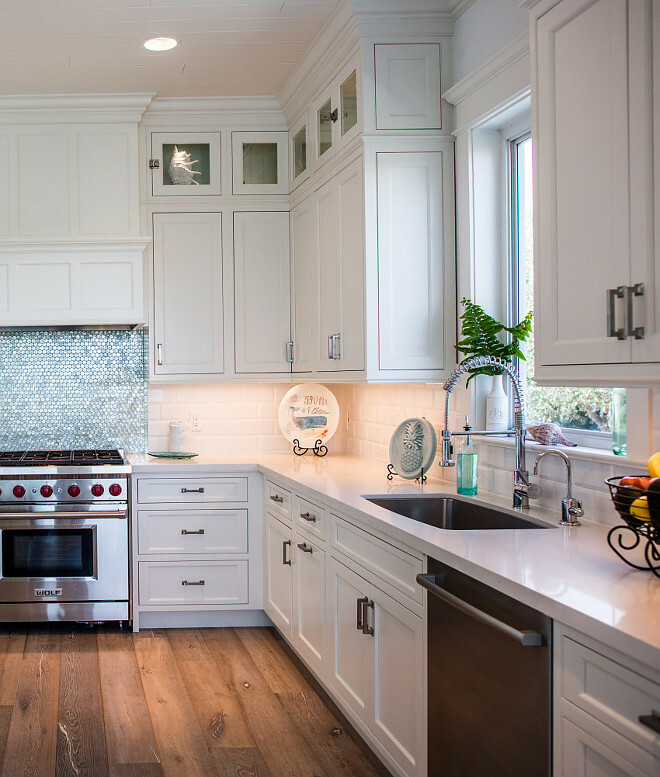 Crystal Cabinets is the manufacturer of all the cabinetry, Waterview Kitchens in Tequesta, Florida designed the space. Monday: Newly Built Newport Beach Home Design. Tuesday: Cape Cod Beach Cottage Design. I want to thank the designer, Patty Anderson, for sharing all of these details with us. She is not only very talented but a very kind person and it’s being a pleasure to talk to her about this project. Have a great day, my friends. We’ll talk tomorrow. This kitchen made my day. Love the layout and the finishes. Mermaids tail. Perfect! I just want to hug you! Thank you for sharing all these gorgeous photos and great decorating on your blog! You are so right about taking a few minutes to dream about beautiful spaces.